Two-Channel Gate Driver features iCoupler isolation technology. Radio Frequency Prescaler Circuits operate up to 18 GHz. 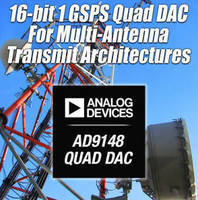 High-Speed Quad DAC enhances wireless base stations. Class-D Audio Amplifiers incorporate IÂ²C interface. 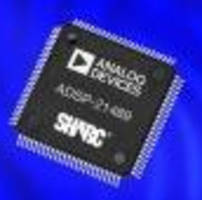 Floating Point DSPs (32-Bit) boost portable device functionality. Integrated RF Circuits suit broadband communications systems. Synchronous Buck Controllers suit rail or POL generation. DC-DC Switching Regulators feature internal compensation. Short-Range RF Transceiver suits science, medical applications.